Clarins recent entry to the BB cream market was well worth the wait. Having tried dozens and dozens of the things over the past year or two, their Skin Perfecting BB Cream is right up there with the very best. Thick, smooth and creamy, this feels lovely on the skin and both perfects and brightens the complexion in the most natural way- see it in action here. Fancy giving it a try? Well, I have three to give away, and in a shade of your choice! To enter you just need to be a follower of this blog and have an address on the island of Ireland, where we can send your prize. Best of luck everyone! Amazing prize, would love to try this! Gutted I can't enter :( Good luck to everyone in Ireland. Oooo would love to try this!! ooooooo I'd love to try these. 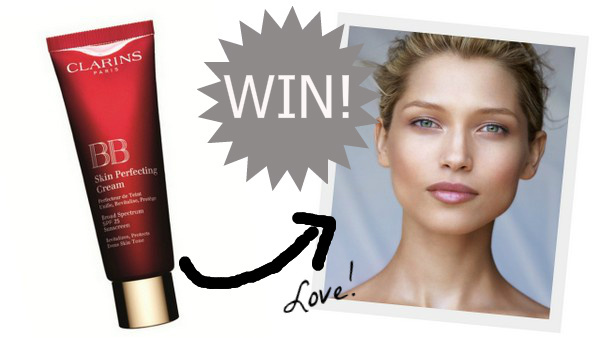 I've never tried any Clarins products so winning this would be great! Great prize! Would love to try this! Would love to give this a go. My fussy combo skin is a bloomin nightmare to find something for! would LOVE to try this.. *looks at blotchy, spotty skin* who doesn't need some skin perfecting! Shamazing. Heard great things about this cream actually, it's great for the busy school run mornings. I've never tried anything from Clarins so fingers crossed! Need to look after my skin more intently the younger I become. I would love to be in with a shout. Fingers crossed and here's a wishing. Excited about this one Emma! I've been looking at these in the siopa for a while, dying to give one a go! Island of Ireland. Always cracks me up. Forget we're an island sometimes! Oh I love BB creams, I would love to try this one. This is a great product. Thanks for giving it away. I'm scrolling through your blog, feel free to drop by me too soon. Ive heard such great things about the BB cream, all the best to the entrants!Thanks for sharing your fashion insight on my last post, have a great start to the weekend! Love Clarins and the blog is great. I'd love to win this, just in time for the good weather! would LOVE this!! SUper giveaway! Wow would love to win this.